Hurrah. Our first show is performed in glorious sunshine in the shadow of the ancient Piel castle. We premiered our show to a warm and welcoming audience. And what a mix. The King and Queen of Piel were in attendance alongside a varied mix of friends and family basking in the sunshine. A coach party of holiday makers visiting from Leeds and Bradford were present as well as the Lakes Alive crew and some friends and funders from Barrow council. The show went very well for a first outing and was well received by all. I enjoyed telling the story of Lambert Simnel on the very island the history occurred so very long ago. I also very much enjoyed being able to point around the coastline at all the locations for our stories. Dalton and Vickers shipyard both feature in our menu of routines and all were visible in the distance to the audience at the point of a finger. Tired and hungry after a long night and day we managed to pack Dolly and not drop her in the sea on the return journey much to the pleasure of the folk waiting to clap us back ashore. We ate well at The Clarks alongside two great friends Alec and Dave who very kindly stayed behind to help us lug our Dolly from the ferry boat. Our meal was very welcome and we realised that in all the excitement we had forgotten to eat anything since breakfast. This coupled with the lack of suncream applied and a relatively sleepless night made the pub a fine place to rest up before our first big push. 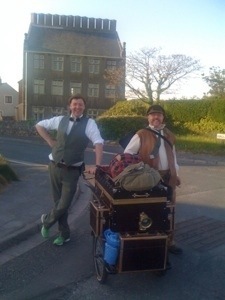 Just three miles to the first camp site, made all the more enjoyable by the warm weather and collection of well wishers tooting from passing cars and appearing on balconies and doorways to wave and tell us they will be coming along to tomorrows gig at Bardsea. One bloke even offered to give us a lift along the road in his 4×4 with a promise of keeping quiet about it. A kind offer but one we were keen to decline. I have driven that road many times and have been looking forward to this adventure for far to long to take a hitch so early. Deeper thoughts in tomorrow afternoons blog i think as the sun has set once more and it’s time to zip up the tent for the night. A huge thank you to all our supporters today. Especially my beautiful wife and smiling son Alfie.